Good news first: Everything's comin' right along. I just finished updating the intro scenario to the most current version of the rules and will be uploading it for all you currently active playtesters out there (as opposed to the inactive ones -- maybe I should call you "Action Playtesters" and "Resident Playtesters" instead) sometime on Wednesday. Which is today, from where I'm sitting. Feedback has been very useful, so thanks for that. Most of it's along the lines of "There's a misspelled word on page four!" but hey, that stuff's important too, so it's all good. More of that and everything else, please. Keep it coming. You're helping make a better game. The bad news isn't really all that bad, but: I'm pushing Round 3 back by a couple weeks. Initially, I'd expected to time it with Big Bad Con, but owing to a few factors, including a totally unproductive first experience at SoCal Smackdown (...), I'm going to hold off. For one, I'd like to be able to incorporate a bit more playtester feedback, from home playtest groups and the Big Bad Con playtests. From my perspective, there's no rush to fix some desperately broken rule, so better to take more time on Round 3 and put out a more complete playtest packet rather than make you pick out subtle differences between the two versions like some overly wordy activity out of Highlights for Children. Now, if you're in Round 3, which is a lot of you, but I guess you don't know it yet because I haven't told you, you're probably like, "Aw shucks." But don't be like that, because when you do get called up, you'll have a tighter, more complete game to play around with. I dunno. Sounds pretty good to me. Expect to see an announcement for that in mid-October. And if you're reading this going, "What the what?" don't just go like that -- get in on the next round of the playtest. I expect it'll run through the end of October, so there's still time to sign up. Science needs you! I played with Morgan Ellis at Big Bad Con and had a great time. I really was surprised and pleased that I was able to pick up Atomic Robo himself and play him! I liked that Morgan put a link to the free comics so that everyone could get a taste of the books and I ended up buying volume 1 and 2 and borrowing 3 and 4 just so that I could have a better understanding of the setting. Specific things I really loved were the aspects already given and the way you could take new ones when you needed them. I liked the skill 'build up', i.e. being able to take what you needed when you needed it and bring it up a few levels. I liked the modes and how you had to limit them and then use the things you really specialized in. Even when I didn't have since most of Robo's stats were already fixed, and it got pretty clear quickly that everything marked out was already 'taken'. I got a little confused with the order of play at first, but then it made sense that the players and the GM could look at the situation and pick who should go next in the line of the story. I'll admit, also, that the whole character sheet was kind of intimidating for someone that didn't know fate that well. I wasn't quite sure where to look for what until we started playing and after a round or two with the skills under the modes, it got very clear quickly. It was very nice having the catch phases on the various sheets for the character as it gave a good feeling for color needed for the character. 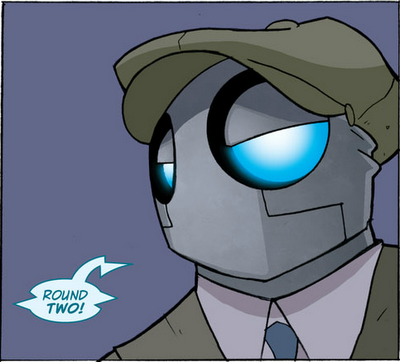 It was a little intimidating to play Atomic Robo, because I didn't feel like I was 'up to' the level of banter that Atomic Robo has in the comicbook. *laughs* I'm not sure anyone does but the writers of the book; however, Morgan's encouragement really did help, and the whole setup of the game made it easy to get into the style of 50's SF. I liked the balance of the characters against the scenario as there really was something for everyone to do. And the whole 'brainstorming' session was a little confusing at first, but doing it 'wrong' made it clear why one might want to start with low rolls. I did learn a lot from the play test on how it should be played. I really want to do a write-up of the game as I usually do that, and I'll send a link when it's up, as I do like advertising new, good games on my blog. Thanks!! [Atomic Robo] Round 2 -- Play!